For the off-road and NASCAR driver, see Walker Evans (racing driver). He was born in St. Louis, Missouri, to Jessie (née Crane) and Walker Evans. His father was an advertising director. Walker was raised in an affluent environment; he spent his youth in Toledo, Chicago, and New York City. He attended The Loomis Institute and Mercersburg Academy before graduating from Phillips Academy in Andover, Massachusetts, in 1922. He studied French literature for a year at Williams College, spending much of his time in the school's library, before dropping out. After spending a year in Paris in 1926, he returned to the United States to join the edgy literary and art crowd in New York City. John Cheever, Hart Crane, and Lincoln Kirstein were among his friends. He was a clerk for a stockbroker firm in Wall street from 1927 to 1929. Evans took up photography in 1928 around the time he was living in Ossining, New York. His influences included Eugène Atget and August Sander. In 1930, he published three photographs (Brooklyn Bridge) in the poetry book The Bridge by Hart Crane. In 1931, he made a photo series of Victorian houses in the Boston vicinity sponsored by Lincoln Kirstein. In May and June 1933, Evans took photographs in Cuba on assignment for Lippincott, the publisher of Carleton Beals' The Crime of Cuba (1933), a "strident account" of the dictatorship of Gerardo Machado. There Evans drank nightly with Ernest Hemingway, who loaned him money to extend his two-week stay an additional week. His photographs documented street life, the presence of police, beggars and dockworkers in rags, and other waterfront scenes. He also helped Hemingway acquire photos from newspaper archives that documented some of the political violence Hemingway described in To Have and Have Not (1937). Fearing that his photographs might be deemed critical of the government and confiscated by Cuban authorities, he left 46 prints with Hemingway. He had no difficulties when returning to the United States, and 31 of his photos appeared in Beals' book. The cache of prints left with Hemingway was discovered in Havana in 2002 and exhibited at an exhibition in Key West. The three families headed by Bud Fields, Floyd Burroughs and Frank Tingle, lived in the Hale County town of Akron, Alabama, and the owners of the land on which the families worked told them that Evans and Agee were "Soviet agents," although Allie Mae Burroughs, Floyd's wife, recalled during later interviews her discounting that information. Evans's photographs of the families made them icons of Depression-Era misery and poverty. In September 2005, Fortune revisited Hale County and the descendants of the three families for its 75th anniversary issue. Charles Burroughs, who was four years old when Evans and Agee visited the family, was "still angry" at them for not even sending the family a copy of the book; the son of Floyd Burroughs was also reportedly angry because the family was "cast in a light that they couldn't do any better, that they were doomed, ignorant". In one of his last photographic projects, Evans completed a black and white portfolio of Brown Brothers Harriman & Co.'s offices and partners for publication in "Partners in Banking," published in 1968 to celebrate the private bank's 150th anniversary. In 1973 and 1974, he also shot a long series with the then-new Polaroid SX-70 camera, after age and poor health had made it difficult for him to work with elaborate equipment. The first definitive retrospective of his photographs, which "individually evoke an incontrovertible sense of specific places, and collectively a sense of America," according to a press release, was on view at New York's Museum of Modern Art in early 1971. Selected by John Szarkowski, the exhibit was titled simply Walker Evans. In 1994, The Estate of Walker Evans handed over its holdings to New York City's The Metropolitan Museum of Art. The Metropolitan Museum of Art is the sole copyright holder for all works of art in all media by Walker Evans. The only exception is a group of approximately 1,000 negatives in collection of the Library of Congress which were produced for the Resettlement Administration (RA) / Farm Security Administration (FSA). Evans's RA / FSA works are in the public domain. ^ a b  Archived March 14, 2008, at the Wayback Machine. ^ "Walker Evans by James R. Mellow". nytimes.com. Retrieved 2014-04-03. ^ Petruck, Peninah R. (1979). The Camera Viewed: Writings on Twentieth-Century Photography. E. P. Dutton. ^ "Walker Evans in Ossining". Ossining.org. Retrieved 2012-10-26. ^ Peter Galassi, Walker Evans & Company. The Museum of Modern Art, New York, 2002, p. 16. ^ Estrada, Alfredo José (2007). Havana: An Autobiography. New York: Palgrave Macmillan. pp. 187, 193–95, 266n. Estrada mistakenly identifies Beals' book as The Crimes of Cuba. ^ Beals, Carleton (1933). The Crime of Cuba. New York: Lippincott. ^ Malcolm, Janet (1980). Diana & Nikon: Essays on the Aesthetic of Photography. ^ a b Whitford, David. "The Most Famous Story We Never Told". Fortune. Retrieved September 19, 2005. ^ "Guide to the Records of Brown Brothers Harriman 1696 -1973, 1995 (bulk 1820-1968) MS 78". Dlib.nyu.edu. Retrieved 2012-10-26. ^ Nau, Thomas (2007). Walker Evans: Photographer of America (illustrated ed.). Macmillan. p. 59. ^ Reena Jana. "Is It Art, or Memorex?". Wired.com. Retrieved 2012-10-26. ^ "Walker Evans". Masters of Photography. Retrieved 2012-10-26. ^ "Walker Evans Entry St. Louis Walk of Fame: Walker Evans"
"Furniture Store Sign, Birmingham, Alabama"
Walker Evans exhibition in the argus fotokunst art gallery in Berlin. Crump, James. Walker Evans: Decade by Decade. Hatje Cantz. ISBN 978-3-7757-2491-3. Hambourg, Maria Morris; Jeff Rosenheim; Douglas Eklund; Mia Fineman (2000). Walker Evans. Princeton University Press / The Metropolitan Museum of Art. ISBN 0-691-11965-1. Leicht, Michael (2006). 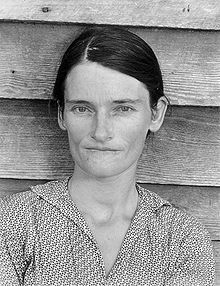 Wie Katie Tingle sich weigerte, ordentlich zu posieren und Walker Evans darüber nicht grollte. transcript Verlag, Bielefeld. ISBN 3-89942-436-0. Mellow, James (1999). Walker Evans. Basic Books. ISBN 978-0-465-09077-8. Rathbone, Belinda (2002). Walker Evans: A Biography. Thomas Allen & Son Ltd. ISBN 0-618-05672-6. Rosenheim, Jeff; Douglas Eklund. Alexis Scwarzenbach, ed. Unclassified: A Walker Evans Anthology. Maria Morris Hambourg. Scalo / The Metropolitan Museum of Art. ISBN 3-908247-21-7. Storey, Isabelle (2007). Walker's Way: My Years With Walker Evans. PowerHouse Books. ISBN 978-1-57687-362-5. Worswick, Clark; Belinda Rathbone (2000). Walker Evans: The Lost Work. Arena Editions. ISBN 1-892041-29-4. Wikimedia Commons has media related to Walker Evans. Salt Lake Utah Article and photographs regarding Walker Evans' time spent in Ossining, NY.